Christmas and New Year breaks this year - isn't it safest to stick to the UK? 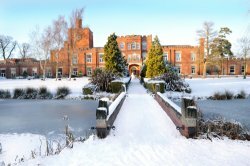 Award winning spa, Ragdale Hall's winter offers are always the best value of the year - there are even two nights at HALF PRICE! When compiling features about ideas for Christmas and New Year breaks this year - isn't it safest to stick to the UK? Please peruse the wonderful spa breaks that Ragdale Hall offer - and brilliant value too, with all meals, inclusive treatments, exercise and relaxation classes AND the best spa facilities in the country, all included. This press release was distributed by ResponseSource Press Release Wire on behalf of Ragdale Hall Spa in the following categories: Leisure & Hobbies, Women's Interest & Beauty, Travel, for more information visit https://pressreleasewire.responsesource.com/about.